Advanced Lip Flexibilities , Complete (3 Volumes in 1), by Dr. Charles Colin. 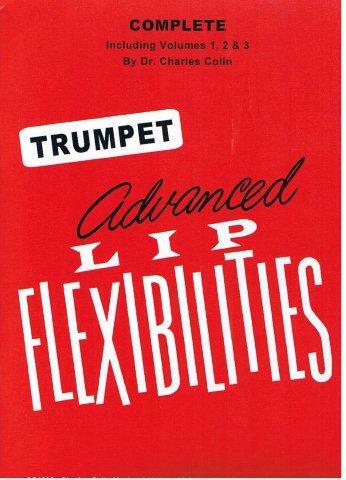 One of the most widely used trumpet study books, this series of outstanding excercises was developed to enhance range, flexibility, and endurance. The preface, by Dr. Colin, guides the player in preparing himself to play the studies. The studies are progressive in difficulty and take the student in moderate stages through basic warm-up procedures to excercises covering spreading intervals, expanding range, and lip trills. Text completely reset and edited in 1980.